MBSD Software, links up the most important methods for the analysis of dynamics and NVH of Powertrains and Drive systems in the time and frequency domain. The 3D Elements module provides a powerful tool for coupled flexural and torsional vibrations of crank trains and the entire driving shafts with elastic or hydrodynamic journal bearings. Furthermore, it offers the possibility for whirling analysis of the critical flexural bending rotary speed in time domain. The eigenmodes of a complete structure can be displayed in a 6 DOF animation. 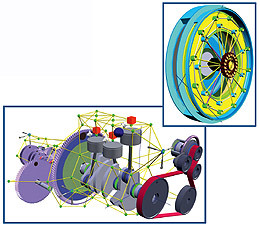 For advanced structural analysis the two moduls, flexible body and modal calculation, complete the modern methods of simulation of multi dimensional MBSD and structural analysis. The possibility to load reduced FE structures and combine them with multi body simulation leads to an enhanced modeling process, which then combined with a modal reduced calculation method additionally reduces simulation time. 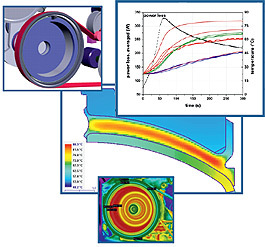 The new SIMDRIVE3D Thermo-Element allows the coupling of thermal and mechanical real time simulation for components with high temperature dependency, e.g. rubber dampers. It calculates the 2D heat flow within rotationally symmetric structures. This module also comprises the features of the SIMDRIVE3D sketcher tool, which facilitates a fast and easy way to set up models/assemblies for thermal analysis. 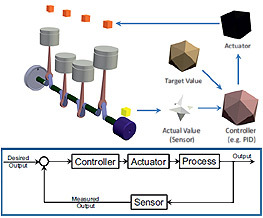 The Animation module is a tool, that enables the user to create animations and visualizations of simulation results in 2D and 3D. Moreover, it can be used to simplify the system analysis as well as freshen up presentations. Allows setting up controlled systems, e.g. for idle speed control or CBC but also for active tensioners and further mechanisms. 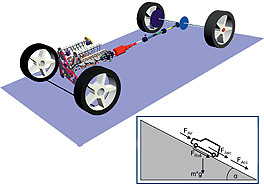 Setup of engine models with a control structure comparable to a real engines with an interpolation of the engine pressure.